MARION — Marion city officials will soon begin reviewing the placement of traffic signs in its school zones in the wake of being contacted by a San Antonio man who says as many as two dozen warning, street and school zone signs in the community don’t comply with state regulations. And so far, he’s only reviewed about a quarter of the city that sits astride FM 78 between McQueeney and Cibolo. Mayor Glenn Hild said he and Public Works Director Randy Schwenn have begun looking at the signs after being contacted by e-mail by Anthony N. Schneider Sr. In a series of e-mails Schneider sent to Marion officials this week that were then sent to the Seguin Gazette Enterprise, Schneider informs Schwenn and Marion Police Chief Reed Crane of what he says are numerous violations in the placement, materials or repair of traffic control signs around the city — including signs placed in school zones that lower the speed limit or prohibit cell phone use, which Schneider says use non-standard colors or materials that raise issues of uniformity with state signs out on FM 78. 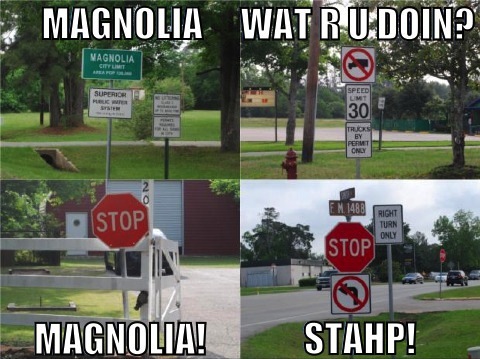 It is a fact many road signs in Gonzales are out of compliance. This was pointed out to local officials recently by Anthony N. Schneider, a San Antonio resident who travels extensively and has made it his life’s mission to correct these problems. “If we are in the wrong, we need to right it and that’s what we are going to do,” said Gonzales Police Chief Tim Crow. Schneider sent several emails to the city and to The Gonzales Inquirer, outlining what he says are violations of the state’s sign laws. Many of the violations are in school zones.